Jorge Blanco, renowned for his colorful sculpture installations with the lyricism and grand proportions that heighten a viewer's sense of imagination, presents SOLO BLANCO at Alfstad& Contemporary, April 19 – May 19. This is Blanco’s first solo exhibition in Sarasota, where the Venezuela-born artist has lived and worked for two decades. “It brings me much joy to finally have my first solo exhibition in my adopted hometown of Sarasota,” says Blanco. In the early 80s, the artist began receiving recognition for a comic strip he produced about an exiled man on a tiny island with a single palm tree—the perfect setting for a comical Castaway. Simultaneously, Blanco was in charge of all graphics designed for the Museo de Los Niños de Caracas (Children’s Museum of Caracas), an institution comparable to a small Disney-land that aimed to teach children about science, technology, culture, and arts. It was there that Blanco created the Museum's mascot, a playful and curious child named Museito, as well as the institution’s entire collection of graphics, signage, publications, animations and promotional materials. That playfulness and whimsy, along with the art historical reference of Klee, Calder and Miro is apparent in all of Blanco’s internationally acclaimed sculptures. While, Blanco’s sculptures can be found in private collections throughout more than forty countries, the increasing monumentality of the artist’s works can now be found as public sculptures in thirty locations spread over the continents of South America, Asia, and North America. The Alfstad& Contemporary exhibition will to be the first to include both large and moderately scaled works by Blanco in the same setting. 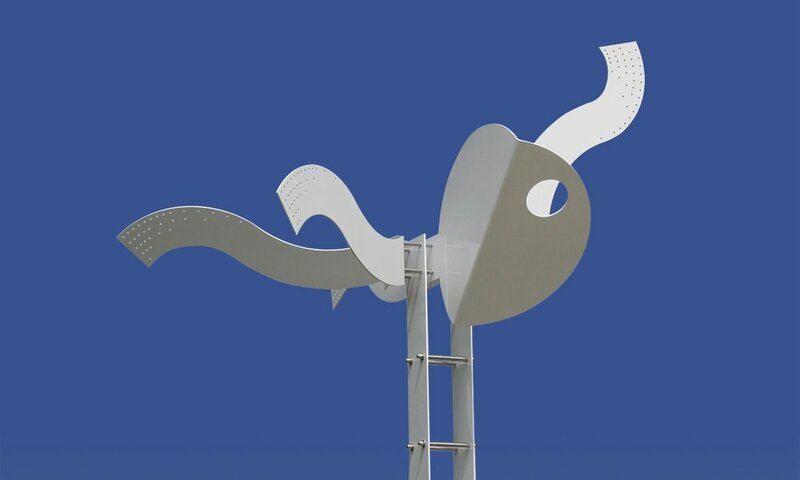 Included are nine powder coated aluminum sculptures ranging from tabletop scale to the 14-foot grand scale, Zethyr (the Messenger of Spring).